Coire Lagan round / Inn Pinn incident! 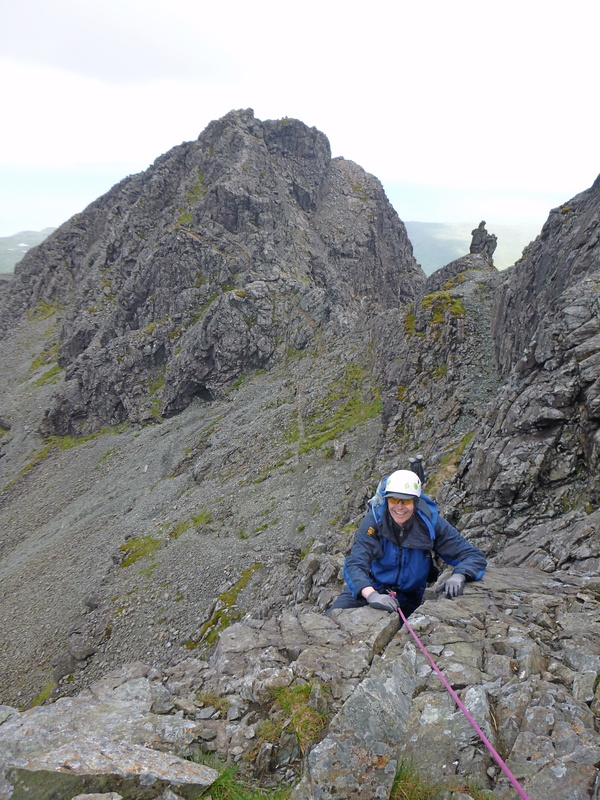 Its been a strange few days on Skye where I was guiding Sandy who arrived on the island with the intention of putting all his Cuillin experience into one big effort to get over the main traverse. There were many decisions to be made but in the end the weather wasn’t looking ideal so he settled for a couple of big separate days on the ridge travelling over ground he hadn’t visited before. 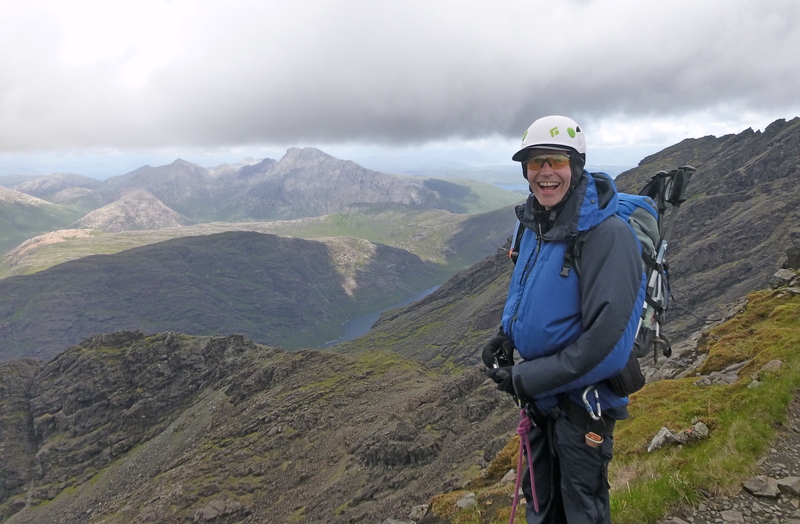 A happy Sandy, this time on Sgurr Alasdair he actually gets some views! Wednesday we started out for the Coire Lagan round in cool, dry conditions thinking – had we been too hasty with the weather?! Up the Sgumain stone shoot over Alasdair and onto the superb Sgurr Thearlaich slabs leading down to Sgurr Mhic Choinnich all went smoothly. We traversed along Collies ledge beneath An Stac where we had a minute to decide whether to go underneath along the slabs or up the crest. 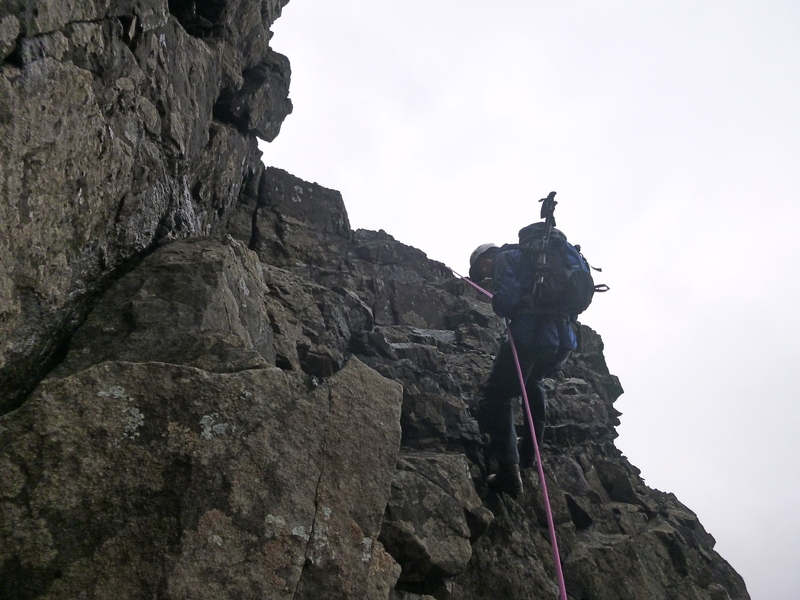 Guy approached with his two happy customers, so we let them go first onto the crest of An Stac when the drizzle increased to rain and with that came our decision to take the simpler approach. We got a wave from Rich who was just leaving with his three successful Inn Pinn climbers before the shouts and screams of a fallen climber came ringing around the mountain. Sandy was happy to make a steady approach by himself so I quickly joined Rich and others to attend to an unconscious climber who had decked out trying to climb the West (steep) side of the Pinn. It was almost midnight before We all got down after deteriorating weather meant a man carry was needed to get the casualty to a suitable location for air assistance to pick up. Thanks to the Skye MRT and Coastguard R951 for all their help, its a big job keeping everyone safe during a rescue in poor conditions. This week I was working for Skye Guides.